The major multimedia element of my production, Red Shoes, is the projection that functions as the set. It help sets the tone for each vignette and carries the viewer on a visual journey through colors and textures and moods. The video is almost beautiful enough to stand alone without the dance or the music or the dialogue, but I enjoy the depth it adds to the performance, creating layers upon layers for the audience to focus on. I began my journey with projection design years ago when creating basic videos of color and shape in iMovie for student performances with the non profit Turning the Wheel. That curiosity evolved and was encouraged by my good friend Alana Shaw when she invited me to dive even deeper into projection art with the creation of a video set for her stunning piece, Stardust and Water. I learned a lot working on the video for that performance, which was mapped to the stage and completely immersed the performers in stars, water, flowers, clouds, watermelon and more. It was quite the accomplishment and it has been refined with each city Stardust and Water visits. Taking what I learned from that monumental project, I was emboldened to create a video for my own one woman show. The video for Red Shoes combines original footage that I have collected over the years, motion backgrounds found online, and videos from the public domain. Two excerpts in the video include choreographed short films that are complete artistic thoughts in their own right and were filmed, edited, and scripted by me for the piece. Below I share some of my artistic insights and creations for various clips in the show! Friday August 18th at the Pine Street Church as part of the Boulder International Fringe Festival. Tickets are still available for all four shows through the Fringe Festival Website. The Rising Sun: I thoroughly enjoy blending two pieces of footage together to create something completely new and original. I especially like to layer my own original footage with clips collected from creative commons and public domain. This shot layers a shot I took while on a walk in Denver of grass in the wind with a video of the sun rising. The combined effect elevated the moment to a beautiful place. Wheel of Dancers: Performance art and projection design aren’t the only realms I explore with my creativity. I also spend a lot of time creating mixed media paintings and it was important to me to include this side of my artistry in the projection. This vignette from the projection is a slow motion video of a mixed media canvas spinning, and then layered with a motion background to reinvigorate the color and texture that appears in person when looking at the painting. I’m so pleased with the overall effect this created. Power within our own Feet: A powerful theme throughout the show is the push and pull of looking outside oneself for power vs finding that power within. One of the stand alone moments in the film features a dance I recorded of my feet, honoring the depth of knowledge and grounding that exists in that part of me. I was honored to layer a film of a friends tapestry over my dance to create even more depth and richness. The final piece is like a visual collage, combining colorful elements to create something that no one has ever seen before. Tornado: Another aspect that I really love about the video is the incorporation of images from the public domain. There is so much wonderful material that has been saved and collected from the past, and with the magic of the internet it’s become extremely accessible. I love the vintage feel it creates, pushing parts of the show into a timeless realm and hopefully creating meaningful connections for individuals watching. Along with clips of storms and tornadoes, images of spiders, forests, as well as audio clips from 40’s radio, are peppered throughout the performance. I’ve enjoyed working on the projection aspect of Red Shoes so much that I am feeling inspired to pursue creating films that can stand completely alone, with no blending over dance and theatre. Let me know if you would be interested in seeing my work evolve in this way. I’d love to hear your thoughts. But first I have to complete Red Shoes! See you tomorrow. Tickets are now available for Red Shoes! Head on over to the Fringe Website to secure your seat at my show. BOGO Tickets for Opening Night! I’ve blogged about my little shrine assemblages many times and I am happy to say that I am at the end of the exploration. This past month I used up the last of my little wooden plaques in the best set of shrines I have created to date! The latest series of shrines are all dedicated to my love of dance, specifically tribal fusion belly dance, which I have been practicing on and off for the past 6 years. This last summer I jumped back into the practice and it has been so rich and fulfilling that I felt called to make art that came from the inspiration I feel from the colorful costumes and intricate dancing. I also want to shout out to my troupe, The Tribal Misfits, for being such fun to dance with and to my instructor Ashanti, who is one of the most creative people I have ever met. Thanks! First I find and create the focal image for the shrine. For this collection I used stills from performances of myself and other troupe members. I started looking for fresh images but eventually came back around to using images from my elements series I created in 2014. 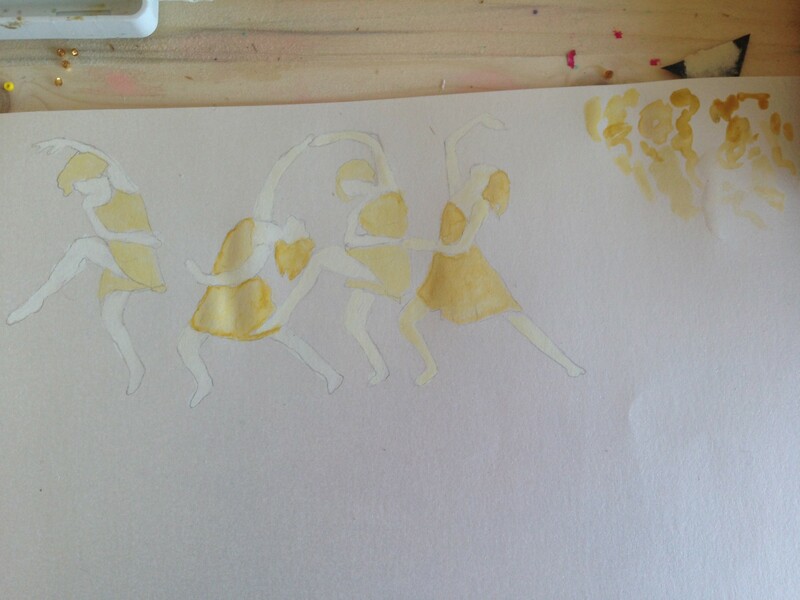 I then set about watercoloring the dancing figures on watercolor, which is one of my most treasured art activities. Second, I decorate the actual wooden part of the shrine. This generally involves a combination of decoupage, painting, and spontaneity. Decoupage is the lovely process of gluing papers and other decorative pieces to an object. I like combining handmade papers, tissue papers, and recycled clippings from cards, gift wrap, and other notions to create a blend of layers and colors. I also decided to spray paint some of the shrines, and also revisit some old patterns drawn on with paint pen that I loved back in 2014. I like all the different textures created from the different techniques. 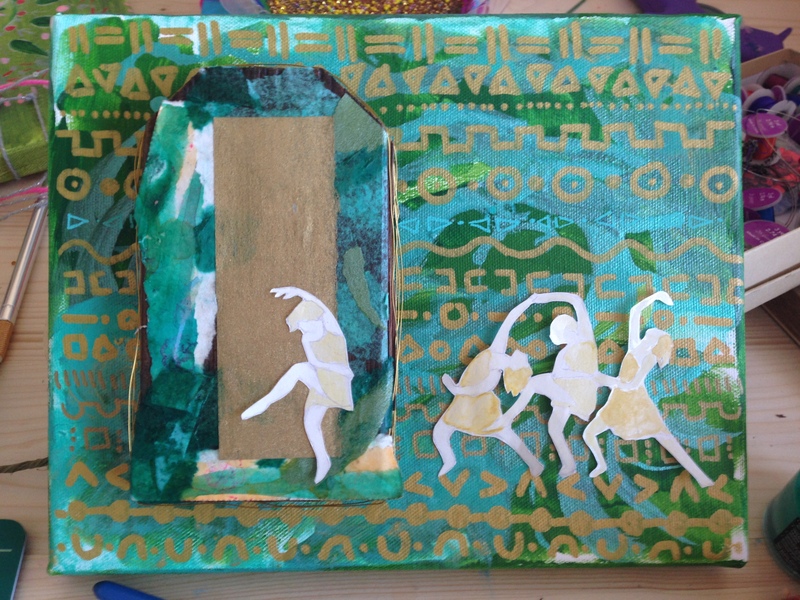 Third, I put the two pieces together, integrating the dancing figures into the decorated shrine. This sometimes involves adding additional elements to blend the foreground with the background and other times simply means gluing the figure on top of everything to create a more bold composition. I have two of each figure in this series, which appeals to my sense of variety. I was also pleased to resolve to shrines that had been lying around in my studio unfinished since I started working with them in 2014. They’ve traveled halfway across the country and back, and it feels so good to say with confidence that they are complete! These shrines, and others, will be for sale at A Place to B’s Summertime Swap and Sell on July 22nd. If you can’t wait till then – please contact me! On Saturday night I had the honor of performing at and donating to Flow for Aleppo. I danced with my belly dancing troupe, The Tribal Misfits, and donated a print to the event’s silent auction. Flow for Aleppo is a fundraising event bringing together Denver artists, poets, musicians, dancers, and foodies for one night only to raise funds for Hand in Hand for Syria. The print I donated was originally created during a 30 days of painting challenge I began in 2014. The somber colors and minimalist feel felt like an appropriate piece of art to donate to the event. I was happy to see a number of bids and contributing a small part to relief. Flow for Aleppo officially raised $8,170!!!! 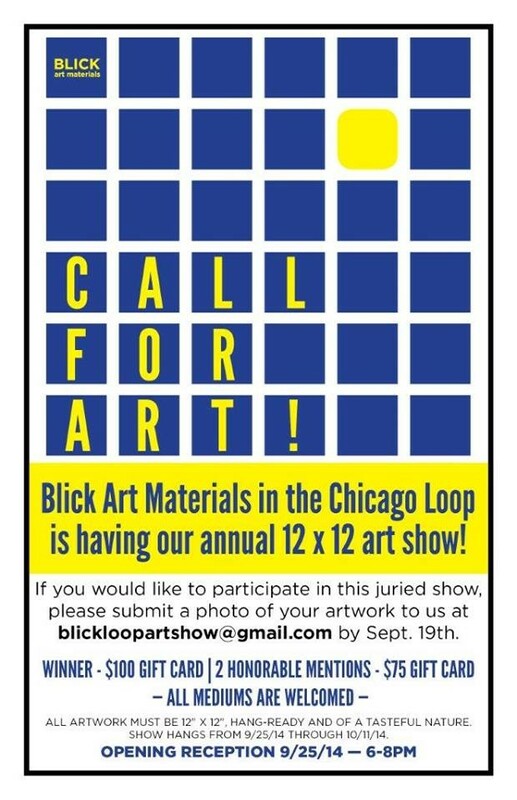 A few weeks ago I answered a call for art from the Blick Art Supply store. This is the piece I submitted and it was accepted. Yay! The opening it tonight from 6 – 8pm. 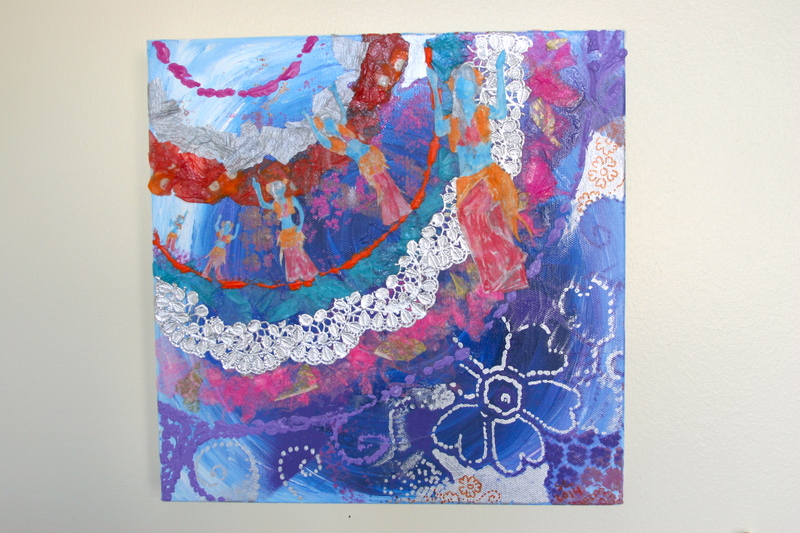 This is piece is titled Dancing Towards Joy. It was the jumping off point for all the work I did for the “Works on Walls” exhibition I was a part of earlier this year. Made with acrylic, spray paint, tissue paper, handmade paper, paint pens, and watercolor. For sale for $150.00. I have finished all the pieces for my art show on the 29th. More on that in tomorrow’s post. This pieces was one of the two that I made as an afterthought, and strangely enough it has risen through the ranks for become one my favorites. The canvas was originally just kelly green. I had a ton of leftover green paint from another painting and I was loathe to just wash it away so I used it on this canvas. Later I realized that with the right application it could become the perfect backdrop for the green and gold shrine I had created on the left. To tie the canvas and the shrine together I added teal liquid acrylic and gold patterning to the canvas. I also added the dancing figures. I have been wanting to use the image of the dancing figures since I first came across the source material. The shapes, colors, and mood of the piece really evoked a sense of Irish Folklore for me and I felt the dancing woman captured that theme. All and all I’m very happy with the piece. Here are some images of my process for those who are curious. And for me to refer to in the future. ^_^ And if you think you have a great title leave it in the comments! Thanks.